End of season wind down camp. We cater for all levels with structured groups for leisure riders to elite racing cyclists. None cycling partners are welcome too. We have a least 2 group leaders in each group, and the group no bigger than 20 riders. We have a policy that we leave as a group and come back as a group. The price includes, half board, free wifi, advise and leadership from our experienced and recognised members of the cycling world along with on road service on long rides. 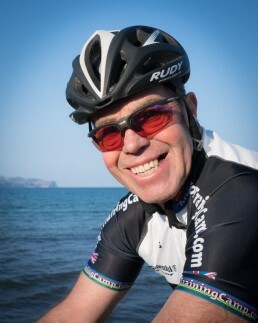 Legro (AKA Dave Le Grys) and his team have organised and run training camps in Majorca for over 25 years. He handpicks his Group Leaders and Massage and Support Team so you get the very best service and value. Legro’s training camp is more laid back and less military than other camps, and, because of our experience in running training camps, you will not be disappointed with the service you receive during your stay. We have two training camps, one in April and one in May, late enough that the weather in Majorca has already started to warm up. We now also offer an end of season wind down camp in October. Providing the perfect way to end off your season or prepare for the track or cross season. Legro is not just a training camp organiser, he is also a very experienced coach, who will be on hand to offer advice and to make sure you get the best from your training. Groups are welcomed and catered for, including, non-cyclists who may wish to travel with their partners. The hotel and apartments we use have a selections of excursions should your partner want to explore the island while you are out training on your bike. You can now book your own flight and take advantage of cheap budget airlines on the internet and for extra convenience fly from your local airport. This will help keep the price down! Why not come and join Legro’s Training Camp – there are no hidden charges, the price includes, half board, free wifi, advise and leadership from our experienced and recognised members of the cycling world, on road service on long rides. For an additional cost we also have a sport massage team ready to help with your recovery.